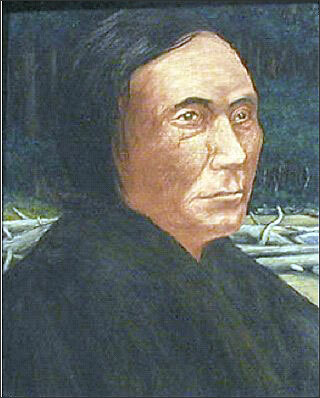 The original natives of the Eatonville area were the Me-Schal or Upper Mountain Nisqually. While the villages closer to the Puget Sound had a greater population, the Me-Schal and other Nisqually villages closer to mountain had fewer members. According to Nisqually historian Cecilia Carpenter, these villages were among the earliest as the majority of people made their way across the Natchez Pass to the other side of Mt. Rainier and on down to the Puget Sound. Often, the Me-Schal would visit other villages. The Nisqually traveled mostly by horse or on foot. When they used canoes, they were not large, sea faring ones rather small shovelnose canoes using long poles not oars. 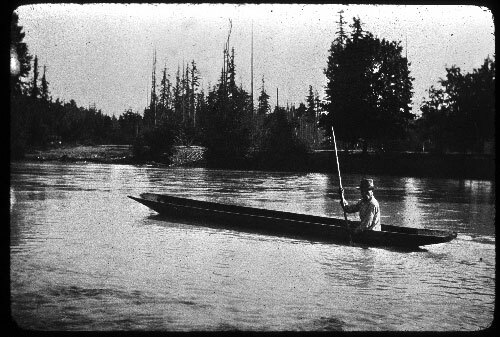 These vessels were flatter and lighter to handle the shallower waters for travel through the Ohop, Mashel, and Nisqually rivers. Back at home, the Me-Schal village consisted of a few, smaller, cedar longhouses, which held more than one family. With the warmer weather came time for gathering, so they wove cattails and created mat shelters that allowed for greater mobility. If the harvesting was a short stay, they formed a covering with fir boughs. When the camas was in bloom, the Me-Schal traveled down to the meadows and encamped along side other Nisqually to dig up the bulbs. They had to wait for the camas to bloom to tell them which bulbs were safe and which were toxic. If the bloom was white, it meant the camas was poison. A lavender bloom signaled a safe bulb to pound down and process to eat or store back home for later use. Many have speculated where the permanent village was located. This is not easy to solve, as there are no remains. Some believe it was up from the Mashel/Nisqually confluence where the Mashel takes a turn. Others believe it was on the Mashel Prairie were there still is a fresh spring conveniently supplying good water. It was a ideal place to graze the horses and near the Mashel, Nisqually Rivers, and Medicine Springs. Another spot could be where the Little Mashel runs into the Mashel River. Artifacts have surfaced from many locations. Near the Little Mashel, Jackie Parnell told of finding a human skull when she was very young. She also found pegs and holders for grease “candles” on the high hill above Eatonville where her home was. Perhaps, it was a look out as Me-Schal villagers were on constant watch for larger tribes coming up to capture their members as slaves. Wherever it was, the village was close the mountain the Me-Schal loved and called Ta-co-bud. The word carries the idea of life giving waters. They never felt the need to climb Mt. Rainier but respected it as the place where a great spirit dwelled. 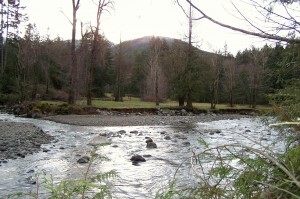 It waters supplied the abundant salmon the people thrived on. One reason the Me-Schal village is significant and why the Eatonville area is scared to the Nisqually was that it was the birthplace of Chief Leschi. The village was still in existence up to the Territorial Wars of 1855-56. B.F. Shaw and Governor Stevens wanted the Nisqually to sign a treaty to surrender and leave their land, which included the Eatonville area. Leschi refused to sign and lead many who also would not leave. Tensions escalated and blood was shed among both settlers and native people. Though Leschi spoke against fighting or attacking non-combatants such as farmers, women, and children, other natives went on rampages against innocent settlers. Leschi tried to create talks with Stevens but had to go on the run as soldiers were sent to capture him. In the panic and rising fear, Leschi was accused of starting attacks and killing a man named Abram Benton Moses. After his capture and two trials, Leschi was put to death by hanging on February 19, 1858. Because of the questionable second trial, Leschi was acquitted by a historical court in 2004. For those of us that have wandered, fished, picked berries, and played in the waters of the Mashel, it is easy to image how life was good for the Me-Schal Nisqually. With plenty of game, salmon, large cedars, cattails, bear grass, and other native people within walking distance to visit, life was abundant.